Another year, another trip around the sun. Birthdays are a big deal to a lot of people. Throw a birthday party and invite your friends, family, and loved ones. And what better way to tell everyone about your birthday than to have your very own birthday flyers! 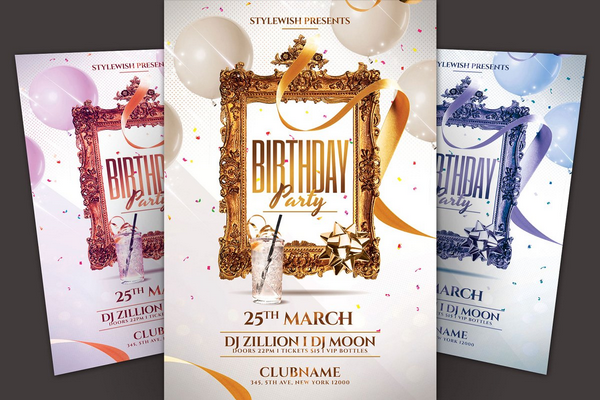 Knowing the theme you want for your birthday celebration will help you in designing your birthday flyer. Is it a pool birthday party? Is it a masquerade birthday party? Your preparations such as food, venue, and dress code will rely heavily on the theme. This is all conveyed to your guests via your birthday flyer. This way, they know what to wear and expect. Your color scheme should be in line with your theme. 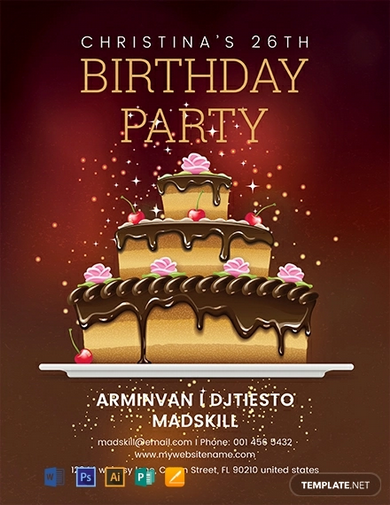 When the theme and the colors match, the birthday flyer becomes more visually appealing. The colors that you choose should fit together like pieces in a puzzle or cogs in a wheel. They say a picture paints a thousand words. It also makes flyers more visually appealing. This also shows your guests an example of what to wear. Set proper expectations using the images. You can show off the theme, the food, even the venue. Be sure to use images that coincide with the theme. Make things easier for your guests by adding all the information that they need. The date and location are the bare minimum of the information needed. You can also add other details such as dress code, parking space, expected menu, and other details you believe to be necessary. 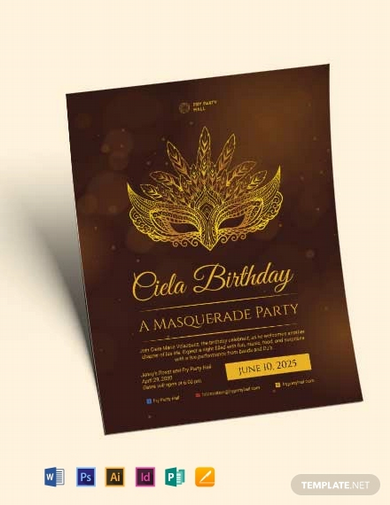 Before having your birthday flyers sent out for printing, have a test batch printed. Depending on the material used, the colors and images may not come out the way you intend them to. This way, you can re-edit the birthday flyers until they look the way you intend them to. Birthdays happen only once a year. Make your birthday the best one you can have by spending it with your closest friends. 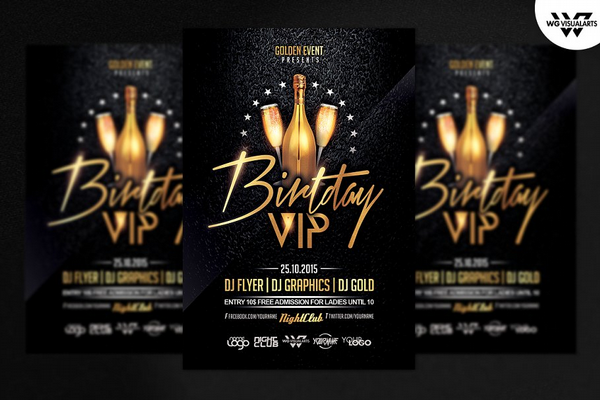 Let them know about your birthday party at your favorite club with this birthday flyer. After all, nothing says party like a club party! Party the night away with your nearest and dearest. 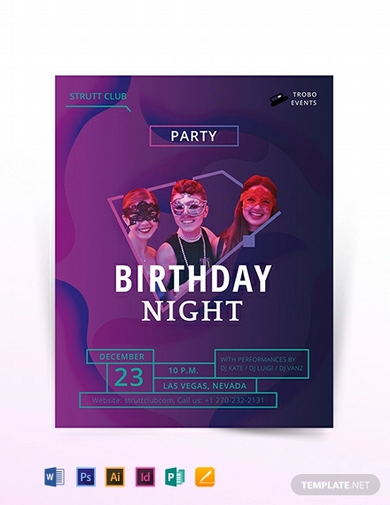 Invite them to a great night out at your favorite night club with this birthday party flyer. This template is downloadable in multiple file types for your ease of use. File types include Microsoft Word, Photoshop, Adobe Illustrator, and other similar editing software. 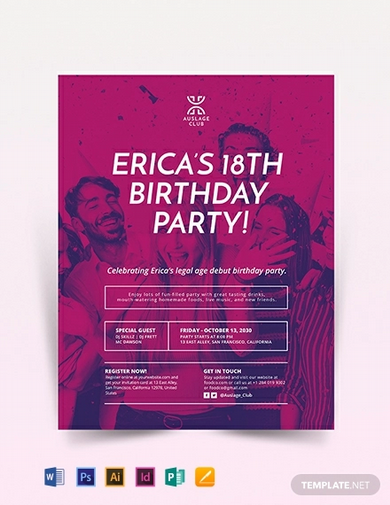 Bright and vibrant, this birthday flyer template is sure to have your friends buzzing with excitement. 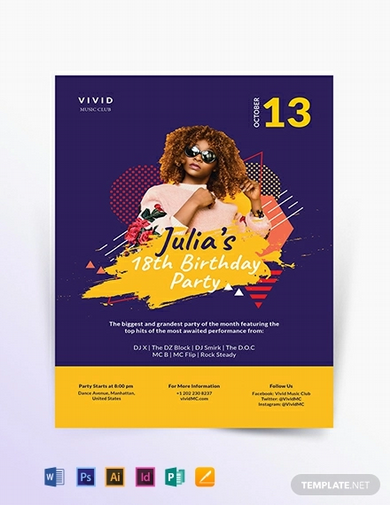 The design is well made and makes use of the available space without overcrowding the birthday flyer with too many words. Download and customize to fit your birthday party theme. Elegant, mysterious, and graceful—these are the words that come to mind when attending a masquerade party. These will be the words that your guests will use to describe your birthday party flyer as well if you use this template. Download now and invite your friends and family to your birthday party. Up up and away! Throw your kid the best superhero themed party ever. 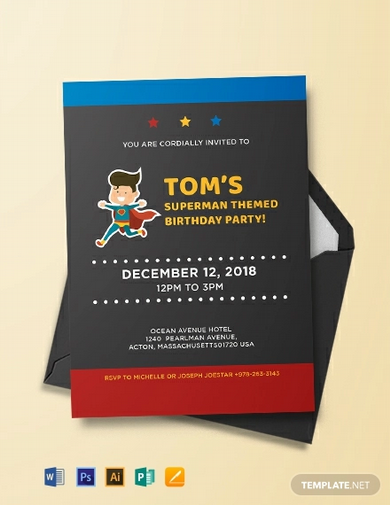 Invite his super friends with this superhero birthday party invitation flyer. Download this super easy to edit flyer template in your preferred file type, and edit. Adjust and customize as you see fit. Make your little princess feel truly royal on her big day. 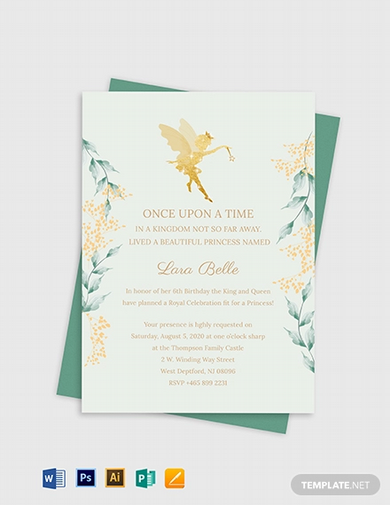 This princess birthday party flyer has the regal look that will make your kid truly feel like royalty. Downloadable in different file types such as Microsoft Word, Photoshop, Adobe Illustrator, Publisher, and Pages for your editing ease. Birthdays come around once a year. And birthdays are a huge deal to kids. Throw your kid the perfect birthday party and invite his friends using this kids birthday flyer. This cute and bubbly flyer will surely bring your kids friends to his party! Invite your friends for a splashing good time to your birthday pool party. This template was designed specifically for pool parties, and is sure to have your friends jumping into your pool! So what are you waiting for? Download, edit, and print! The only other thing you have to worry about is where you hid your swimwear. Birthdays are special. Be sure to celebrate yours with the people who are special to you. 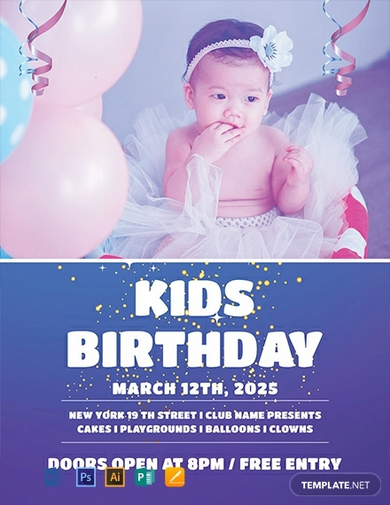 Invite them to your party using this birthday party flyer. Download in one of its multiple file types. File types include Adobe Illustrator, Microsoft Word, Photoshop, and other similar editing software. This template bast an elegant design. 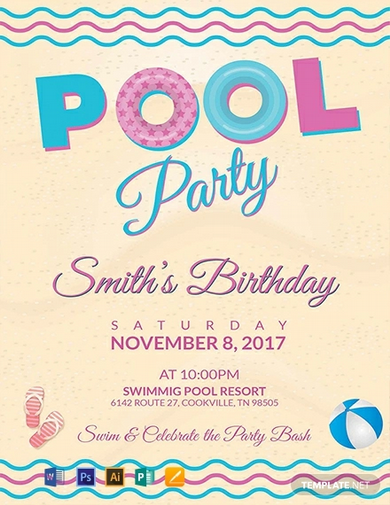 Professionally made with birthday parties in mind, this birthday party flyer will surely catch the attention of your nearest and dearest. Download and customize to fit the theme of your birthday party. So what are you waiting for? You have a party to invite people to. You only live once, so make every moment count! Throw the best birthday party and invite all your friends! No need to design a party flyer from scratch. Simply download this party flyer, edit to your liking, and print! You and your guests are sure to have the best party ever!